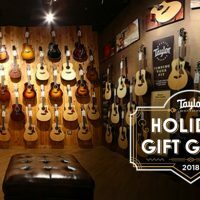 The holiday season is here, and if there’s a musician in your life or you’re hoping for a new guitar for yourself, that means visits to the local guitar shop. When you head to the store, it’s always nice to have a few guitars in mind so that you know what to look for. 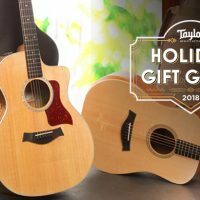 Here are a few guitar gifts that we’ve chosen not just for their rich tone and stellar craftsmanship but also for their versatility—whether you’re a heavy strummer playing country, a light player focused on singing, or a fingerstyle virtuoso, these guitars will do the trick. 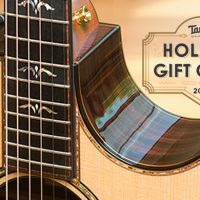 Visit the Taylor Guitar Holiday Gift Guide for more helpful information on holiday shopping. 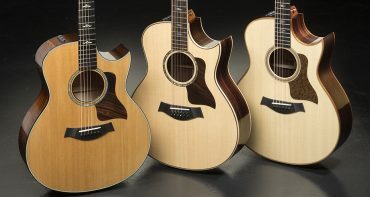 When we talk about Taylor’s quality standards, people might assume we’re referring to our all-solid-wood guitars. 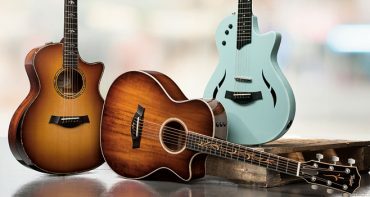 But we’re committed to quality across our entire guitar gift line, and that’s why players love our 200 Deluxe Series. The Grand Auditorium 214ce DLX, made with a solid spruce top and layered Indian rosewood back and sides, delivers a feel and sound that belie its more accessible price tag. 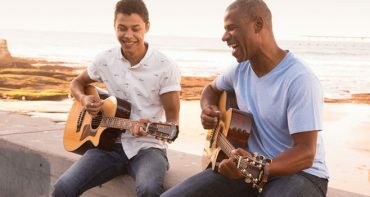 Clear treble notes blend smoothly with the guitar’s punchy mids and full-bodied lows, forming a balanced sound that shines in any situation. Since the 214ce DLX features layered wood construction, it boasts a durability that makes it a perfect choice for a touring guitar. The full-gloss body provides a nice stage-ready sheen, and with the same Expression System 2 (ES2) electronics that ship with our finest guitars, the 214ce DLX performs admirably when played through amplification. It’s perfect for recording and jamming, and makes a trusty sidekick on the road. 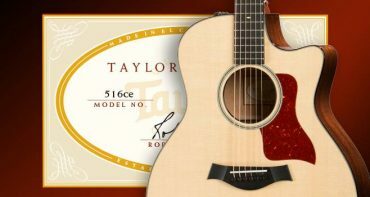 An upgraded version of the Taylor flagship 814ce, this deluxe model has been refined to provide the best possible playing experience and tone quality. In addition to the trademark slim Taylor neck, we’ve added a radius armrest, which takes the edge off the bass-side lower bout of the guitar and makes it easier to play, especially while seated. 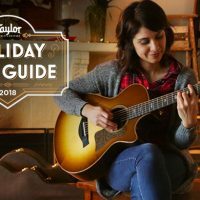 The solid-wood construction combines a Sitka spruce top with Indian rosewood back and sides, a classic tonewood pairing that delivers a rich, full-spectrum voice brimming with low-end warmth, bell-like highs, sparkly overtones, and pleasing sustain. 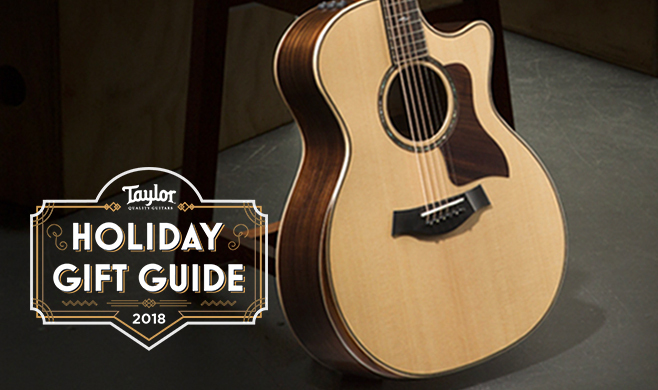 Two more “deluxe” features elevate this Taylor classic to another level. 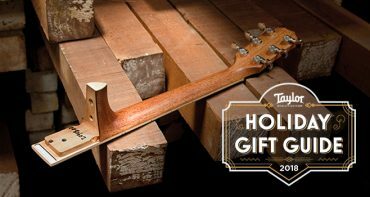 We’ve braced the top and back with Adirondack spruce, a springier, more flexible spruce species that gives the guitar extra headroom and dynamic capability. We’ve also upgraded the tuners to Gotoh 510s, which boast a 21:1 gear ratio that allows for more precise tuning control on an instrument that is already finely calibrated to maintain produce a beautiful sound. No matter what your skill level, the 814ce DLX will enhance the quality of your playing. Let’s show the classics some love. Our Dreadnought 410e-R brings the top-flight tonewood pairing of solid Sitka spruce and solid Indian rosewood to a time-tested body shape. Together, the body and woods unleash a throaty low-end rumble, snappy mids, and clear, assertive highs, adding up to a robust all-around sound that can accommodate an array of musical styles. It’s a wonderful workhorse of a guitar, churning out plenty of volume to help strummers and pickers stand out, with ample punch for your leads to cut through a mix. 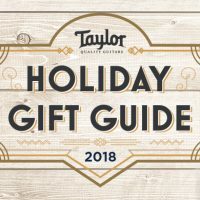 We’ve also made the nut on this model slightly narrower (1-11/16”) than our standard 1-3/4” width; together with Taylor’s sleek neck profile, it makes barre chords a little easier on the hands. 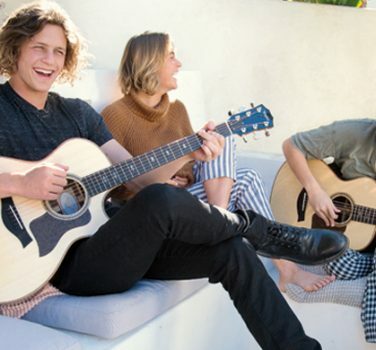 Whether you’re looking for a reliable gigging guitar or an all-purpose strummer for home, the 410e-R has you covered. The lovable GS Mini is without question one of the most broadly appealing acoustic guitars we’ve ever made. It packs a full-size voice into a scaled-down Grand Symphony body with an easy-playing neck that everyone from kids to adults can navigate. Between the compact dimensions and simplified appointments, it’s super-approachable, and together with the durable layered-wood back and side construction, it’s not too precious to take on a camping trip or pass around among friends. This edition features an upgrade to Hawaiian koa, featuring a solid koa top with layered koa back and sides. Beyond the natural aesthetic appeal of koa’s color and wood grain, the solid koa top, which is denser than spruce, helps evens out a lively strumming attack. Players can expect a bright top end and a punchy sound that jumps out of the body. (It helps that the guitar features the same size soundhole as our full-size models.) The thinner varnish finish also allows the guitar’s woods to resonate more freely. This koa edition also comes equipped with our ES-B electronics, which include a built-in digital chromatic tuner for added convenience. The ability to plug in gives the guitar extra versatility for performance or recording applications. 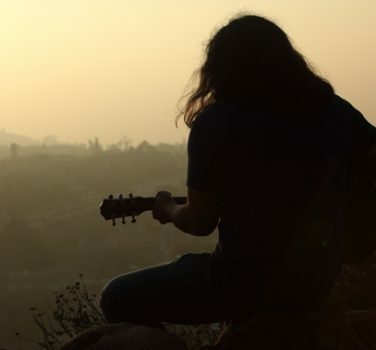 While many recreational guitarists enjoy the shimmering voice of a 12-string guitar, surprisingly few players own one. The knock on 12-strings is that their traditionally bigger body size, coupled with the extra strings, makes them cumbersome to play. We’ve solved that problem with the small-body 562ce, a comfortable, easy-playing Grand Concert 12-string with a 12-fret neck. The 562ce features all-solid Neotropical mahogany construction, with a smooth Venetian cutaway for easy upper fretboard access. The smaller Grand Concert body makes it easier to set the strings in motion, so the guitar will respond to a light touch. It also won’t overpower other instruments on stage or in a recording mix, which makes it a wonderful tool for adding acoustic texture to a song. The combination of the 12-fret neck and 24-7/8-inch scale length contributes to a surprisingly relaxed feel on your fretting hand. 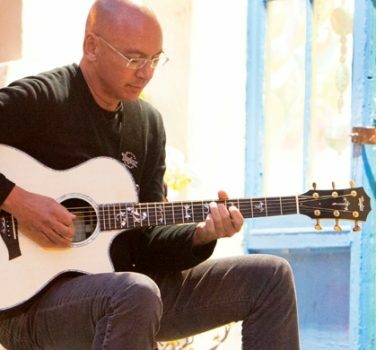 A few strums on this guitar and you’ll be craving a 12-string for your acoustic quiver.